Spring is here which means pest activity is on the rise. Termites are one of the top pest concerns for many city dwellers and rural residents alike. 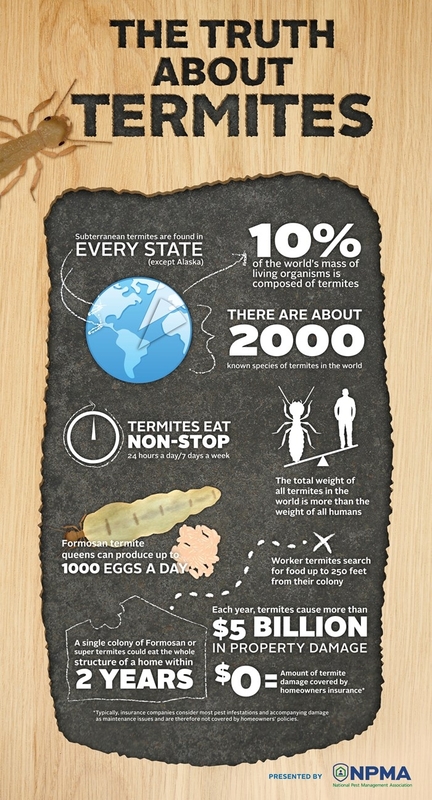 The infographic shows some interesting facts about termites. Here in California, there are three kinds of termites considered pests including subterranean termites, drywood, and dampwood termites. The Formosan termite is one kind of subterranean termite found in California, although in limited areas. Treatments differ for each type of termite, but there are many things you can to reduce infestations. This includes removing wood piles and scrap wood around the home, keeping substructures dry and well ventilated, and finishing exterior wood with sealants or paint. If you are experiencing termite issues, consult the UC IPM Pest Notes publications Subterranean and Other Termites, Drywood Termites, and Hiring a Pest Control Company.